Wesleyan Media Project have released data which shows the massive extent to which Romney and his supporters dominated the Florida airwaves. Romney and his SuperPacs ran almost 13,000 ads on broadcast television across the state, whilst Gingrich and his supporters have aired only 200 spots. 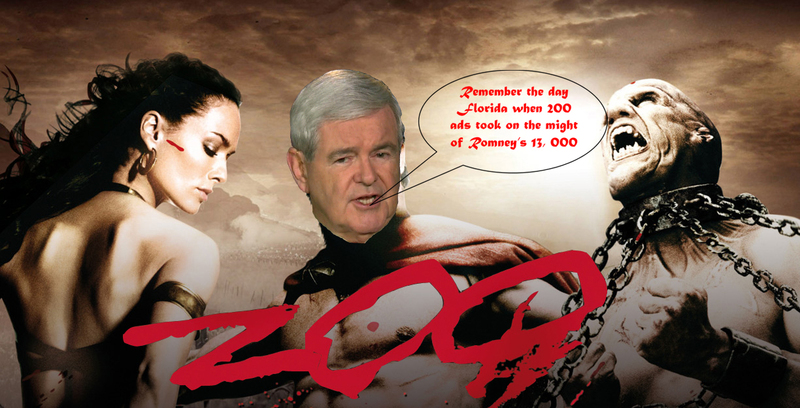 Newt is fighting an advertising battle reminiscent of King Leonidas and his famous 300. With such huge numbers against him, Newt needs find his creative equivalent of the ‘Hot Gates’ of Thermopylae. If Newt can create copy which has enough magic to go viral (as Will.I.AM managed to do for Obama in 2008), he could make Romney’s numbers count for nothing.